March 4 is the only day on the calendar that’s also a military command — march forth! — so it’s only appropriate that this be the day that we celebrate the servicemen and servicewomen in our lives with National G.I. Day. Soldiers in the U.S. military — including members of the Army, Air Forces, and Marines — have been referred to as G.I.s since 1940, and today is the day that we celebrate everything they do for us with a big hug, either literal or metaphorical. If there is a G.I. in your life, show them your appreciation by giving them a squeeze! If you don’t have a close friend or family member who is serving, offer a friendly handshake to servicemen and servicewomen you see out in the world, and ask to give them a hug if you feel so inclined! A gift can feel like a hug, so send a box of goodies to the G.I.s in your life as the ultimate way to say thanks! Often-requested items include playing cards, snacks, toiletries, and of course, handwritten letters! If you don’t know any G.I.s, there are several non-profit organizations can help you send a package to a soldier in need! The internet is a great way to connect with G.I.s! Send an email thanking a G.I. you know and love, explore the #NationalHugaGIDay hashtag on Twitter or Facebook to find out about events and celebrations in your area, or make and share a post of your own! There are 1.4 million active-duty U.S. military personnel who have devoted their lives to the service of our country, and we love each and every one of them! These G.I.s have chosen to spend their lives serving in the military, and we couldn’t be more thankful. Some G.I.s make the ultimate sacrifice in service of our country, and to the G.I.s who have given their lives, we are so grateful. But every G.I. 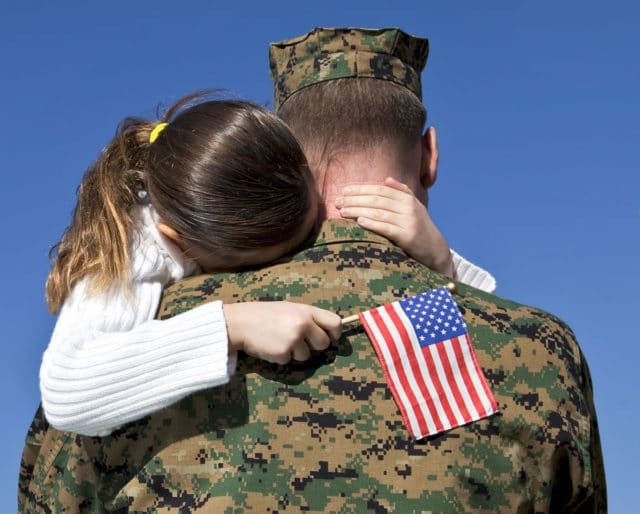 makes sacrifices, whether it’s being away from their family while deployed, moving around the country and world every few years as they are transferred where they are most needed, or facing stress and danger as they put themselves in dangerous and complicated situations. While the primary job of G.I.s is to defend the United States, G.I.s do a lot more than fight. They also provide aid and assistance during natural disasters, perform rescue operations, and provide humanitarian relief. They serve as ambassadors of the United States around the world, and we are so proud to have them represent us!